I got a blue screen error, what should I do? - Ask Leo! I got a blue screen error, what should I do? Blue screen errors are less common than they used to be, but they can still happen for a variety of reasons. I'll review what to do, and when. The computer shut down and then restarted and I re logged in and everything seems to be fine. I’m not sure how to interpret the error message and am not sure where the “collected data” went. Would like your advice on what to do next – do I pursue the MEMORY_MANAGEMENT topic or ignore the event or something else? In short: back up regularly (you’re doing that already, right?  ), and carry on like nothing happened. Until, or unless, it starts happening more often. Then things get complicated. A blue screen (the “BSOD” or “Blue Screen of Death”, or occasionally “bluescreen”) is Windows’ “last ditch” approach to error reporting. Something has gone so wrong that Windows can’t make any assumptions at all about how to safely recover, so it doesn’t even try. All it can do is halt your system completely. A blue screen error is the last resort, and it happens only when trying to carry on might actually cause more damage. Your only recourse is to reboot. Blue screens certainly don’t happen as often as they used to, but they still do happen occasionally. Exactly why they happen varies dramatically. Anything from a bad sector on a hard disk to a cosmic ray can cause your computer to unexpectedly blue screen. If a blue screen happens only once, typically there’s nothing really to worry about. Yes, it’s annoying, and hopefully there won’t be any negative repercussions, such as data loss. But the bottom line is that every so often, it is still possible to get a blue screen without really knowing why, or without really needing to take any action. The important point here is that this should be very rare. If blue screen errors start to happen more frequently, it’s a sign of some kind of a problem. Unfortunately, exactly what problem is almost impossible to determine from just the blue screen information itself. We have to start looking at other things and making educated guesses about exactly what may or may not be happening. Repeating blue screens can happen for either of two very distinct reasons: hardware failure or software problems. Hardware changes. If you’ve added or replaced hardware on your computer recently, that’s one of the first places to look. Sometimes the solution is as simple as replacing the hardware, or at least temporarily removing it to see if the problem goes away. Driver updates. Since any hardware change on a computer typically involves a software change in the form of updated or additional drivers, we also have to be concerned that perhaps the drivers themselves are at fault. Thus, the next step is to make sure you are running the most current drivers for any hardware on your system, particularly any hardware that was added or changed recently. Other software updates. Another go-to diagnostic step is, in fact, to make sure that your system is up-to-date. Occasionally, blue screens are the result of software bugs or errors that may be fixed by subsequent updates. Overheating. When the blue screen errors you see are somewhat frequent – perhaps happening when you do something specific, like playing a processor-intensive game – overheating is one thing to consider. 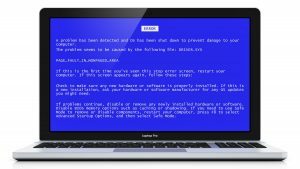 Not only is overheating a relatively common cause of computer crashes, often those crashes will manifest as blue screen errors. Failing disks. Hardware that is beginning to fail, particularly hard disks, can manifest as a system that crashes in the form of a blue screen. Thus, another good diagnostic step to take is to run CHKDSK /R on the hard disks on your system. This will actually scan the surface area of the disc for physical defects and attempt to repair them. Physical defects on the hard disk surface can cause misreads of data, so that a program could be loaded incorrectly, causing the instructions to the computer to become garbled. This, as you might guess, can result in a blue screen. Failing RAM. Since RAM contains the instructions that the computer executes, faulty RAM can cause those instructions to become garbled, causing a blue screen. Running a memory test on your system is a good idea. Malware. This typically isn’t the first thing I think of when a computer starts displaying blue-screen errors, but malware – specifically, bugs in malware – has been known to manifest as blue screens. Make sure to run up-to-date anti-malware scans. As you can see, the fact that the error refers to memory doesn’t help narrow down the source of the problem. It could be memory, but of course it could still be something else entirely. On rare occasions, googling the actual information from a blue screen can get you information that relates to your problem. Unfortunately once again, this varies dramatically, depending on the specific problem that you’re having. In most cases, however, we’re stuck with the trial and error form of diagnosis. Why Does My Computer Blue Screen? - There are many reasons your computer could get the "blue screen of death". I'll review some things you can look into to help determine the cause. What Do I Do About a Blue Screen on Shutdown? - Blue screen on shutdown could be indicative of an issue with either hardware or software. We'll walk through some steps you can take to deduce the problem. Why do I get a black screen on my computer after a while? - A black screen on your computer can mean several things. A black screen is most commonly a screen saver, but there are other possibilities. Why Does My Screen Go Black When My System is Out of RAM? - If your monitor suddenly goes black due to being out of RAM, it's likely your computer has crashed. 1: That’s one reason it’s hidden in more recent versions of Windows. In reality, the detailed information provided by a blue screen is really only helpful to the engineers actually working on Windows or driver software. I used my HP computer (runs WIN7) one week; it worked perfectly and then I turned it off. When I started it again the next day I got a blue screen and the message IRQL_not_less_or_EQUAL. I have not changed hardware or software, or done anything different since using it the previous time. Ray’s suggestion is helpful, is a start, but those Microsoft tips are pretty generic. Win7 Forum has a BSOD section with experienced volunteers. I’ve used them a few times w/ success. Their approach to BSOD problem solving is very systematic, somewhat time-consuming, and often gets at a very specific problem/solution. You can look at previous BSOD posts to see how they operate. Recommended. I was having that problem with Windows 10. Turned out that my hard drive was about to fail. Windows kept giving me different errors, and no real information. Any way. I replaced my hard drive, did a clean reinstall of Windows 10 , and all worked well for about 2 days. The blue screens started yet again. This time , it turned out to be my HP printer software ( according to the memory dumps ). The Win 10 updates from HP did not work for me at all. Uninstalled , disconnected the printer, and all has been great ever since. The info on the blue screens do not always mean what you think they may , even when you Google them. There is a free Blue Screen view package from Nirsoft that I have downloaded and used in the past. It doesn’t make you any more knowlegeable, but at least it gives you more information that you can use to search with. (There are also instructions on how to get Windows to generate MiniDump files for a Blue Screen if your system doesn’t already). I agree with Leo that for a 1-off it’s not worth following up, but if at least you ensure that you have a minidump file, then you can always follow up later (and see if it’s the same problem) if you get it repeatedly. I finally got my older vista machine up and running better than it ever had, upgraded memory, replaced failing hard drive, replaced failed video card–long learning process and not easy for someone who has little technical experience and no techie friend to help (and no money for hired technical help once my Dell support contract ran out). All was wonderful for a few days. And then started to get blue screens–do the problems EVER end?! lol Could foresee MANY more hrs researching, experimenting to find the solution(s) from among all the possibilities, and creating more problems by accident in the process if my past experience was any indicator. But THEN, I lucked upon this Dell site with a wonderful tutorial on using the Windows debugger, showing how to find the dump files that give the info about what caused the blue screens and then using the debugger to analyze it for you. IT’S SO GREAT. Turns out none of the most common problems were causing my blue screens, which surprised me considering how many hardware changes had been made. It was instead my Avast antivirus that had installed it’s addition of security for hardware virtualization, even though my processor does not support it. EVERY blue screen analysis pointed to that one Avast driver in one way or another. It took a couple days on the Avast forum until another newbie was able to tell me where to go to uninstall that particular portion of the Avast problem and VOILA, problem solved. I have not seen anything relating to this. After the post-November update BSODs on my Tablet the scanning and repair takes place, not my (C) drive which has the OS, but for (D) drive, a Memory Card which has programs / apps, docs, media. Why would this be? At this stage it seems likely that the problem may lie with the Display Adapter driver. I bought a kit (case, power supply, motherboard, CPU, and RAM) from a trusted vendor, assembled it, and gave it to my nephew. After a few days, he kept complaining that it was continually bluescreening, restarting, running for a while, then bluescreening again. Everything seemed to test out well. I wanted to take each stick of RAM out at a time to see if that was a problem, but the kit came with a single 8gb stick of RAM. I exchanged that one stick with another computer that had two 4gb sticks, and the blue screening stopped. I thought that maybe the 8gb stick was faulty, but it’s been in the computer I made the exchange with for quite some time now, and it has performed without a hitch. I’m happy with the results, but still baffled about why that little change made the difference. I’m noticing, on both my Windows 7 and Windows 8.1 computers, that the Windows 10 update “request” is getting more and more persistent. Hi, windows 10 has downloaded and windows 7 has been replaced. Unfortunately my pc is stuck in a diagnostic loop and everything it tries to do to repair it including advanced options fails!!! Please help! !